In anticipation of this year's Piglet, we'll be sharing articles, recipes, and tips from past winners. Following The Art of Living According to Joe Beef is A Girl and Her Pig. Learn more about this year's tournament here, or head to Provisions to add some of the titles to your bookshelf! 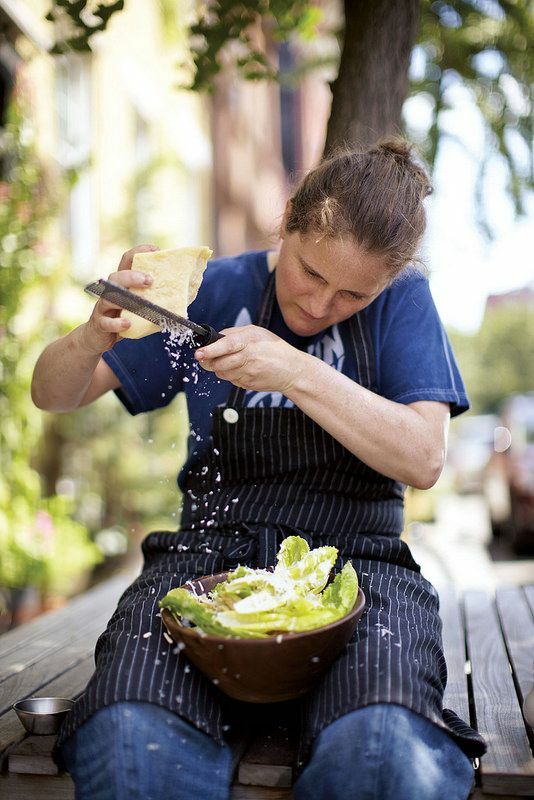 Today: April Bloomfield shares A Girl and Her Pig's first recipe of the week -- get ready to make some Caesar salad. I grew up eating boring salads, horrible and underdressed. The old-school salads I learned to make at culinary school, like Waldorf and Niçoise and the mayo-and-curry-spiked Coronation Chicken, were better, for sure. But the Caesar was the first salad I ever really loved. Soon after I graduated, I got a job at a restaurant called Kensington Place. Rowley Leigh, the chef, would mound plain Gem lettuce on a plate and serve it with Caesar dressing on the side. Oh, that dressing! Not only was the flavor a tangy, umami-packed thrill, but it was also very “clean,” as we chefs some­times say. That is, you could taste the individual components -- first to register was the saltiness, not necessarily the fishiness, of the anchovies, then came the Parm and garlic, and finally, the tang of the vinegar. Because of my early bland salad experiences, I like mine extra punchy -- even, in this case, what some people might consider a little overdressed. Romaine is quite watery and it needs the dressing to cut through that flatness. This is a salad I like to make and eat with my hands. I rub the dressing onto each leaf, each one like a little canoe. I’m especially fond of the freshly-baked-bread taste of the croutons -- which makes you want to seek out another, and then another -- and the refreshing quality you get from serving the salad chilled. Eat it quickly, before it warms up. Any sub for the anchovies? I know, I know. There are just some things, like the look of anchovies, that I can't get over. It's a shortcoming. What can I say. ATG117, Close your eyes and try one. They are delicious. I've subbed capers for anchovies a number of time, mushed into a paste. Pretty good! Note: not in this recipe though... considering how much this recipe really focuses on the anchovies, I think nothing could replace them. I want to try this big time! 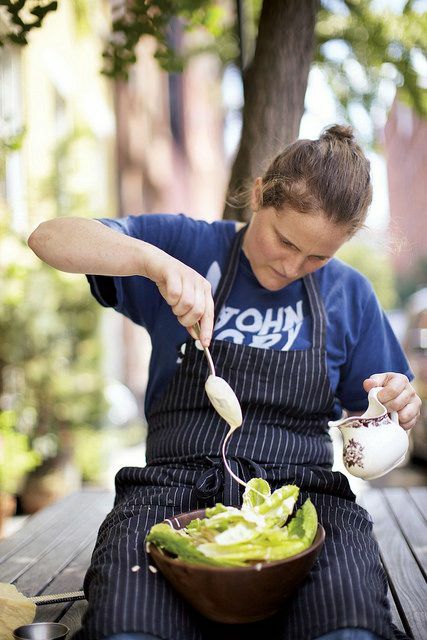 Huge April Bloomfield fan. Love her restos, so I was excited when her cookbook came out - it's so inspiring + awesome. I've made several recipes and they totally deliver. Chef is spot on - this dressing is "extra punchy" - in the best way. LOVE Caesar Salad! This looks incredible! I, too, am obsessed with these photos. And I can't wait to make this dressing! It's been lingering on my list for far too long. Here's to aggressive salads. And slightly overdressed ones! Can't wait to make this either. The pictures at the top of this article are absolutely perfect. Is there a better visual of the word "gusto"? One of my first restaurant jobs was one where I rolled a huge cart around making a version of Ceasar Salad not unlike April Bloomfield's. It has always been my favorite salad, anchovies and all! It's mine too! I could eat bowls of it, every day.